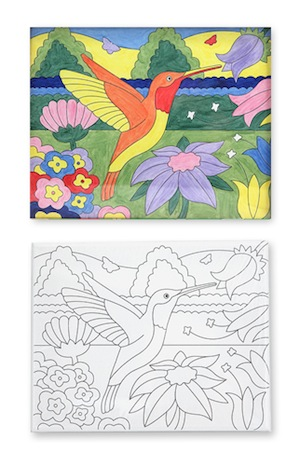 Let your child's imagination take flight while adding creativity and detail to this beautiful outdoor scene. Use the mixing tray to create exotic colors with the six included paints and paintbrush. Dimensions: 8" x 15.75" x 1" Packaged. Recommended Ages: 4+ years. Contains small parts.